Six months after the launch of the Oppo F7, the Chinese manufacturer has decided to launch its successors, the Oppo F9 and Oppo F9 Pro in India. These two smartphones have identical specifications except for the amount of RAM, and their prices in India have been set at Rs. 19,990 and Rs. 23,990 respectively. The key highlights of the Oppo F9 and Oppo F9 Pro are their waterdrop-shaped display notches, a sleek new design, updated Color OS 5.2 software based on Android 8.1 Oreo, and amped-up camera features. The design in particular, has been given a lot of importance, and the smartphones have been positioned as 'fashionable'. We got a chance to tinker with Oppo F9 and Oppo F9 Pro for a short period, and here are our first impressions. 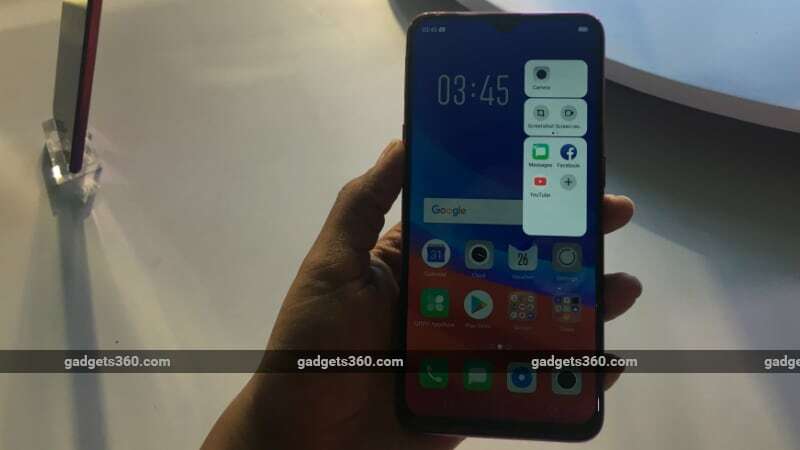 The Oppo F9 Pro offers a lot of screen space with a 90.8 percent screen-to-body ratio and a waterdrop-like notch on top to accommodate the front camera. The screen measures 6.3 inches and has a full-HD+ resolution. It produced good colours, wasn't very reflective indoors, and had decent viewing angles. However, smartphone displays need to be tested outdoors, and our upcoming review will go into more detail. Just above the camera, Oppo has integrated a sound conduction plate to ensure that call quality is not compromised due to bezel reduction. There's little to no bezel on all the other sides, and the smartphone is comfortable for one-handed operation, although the finish is a little slippery. The Oppo F9 Pro has volume buttons and a triple-slot tray for two SIMs and microSD card on the left, and the power button is situated alone on the right edge of the smartphone. The 3.5mm audio jack, microUSB port, and speaker grille sit on the bottom of the device. The Oppo F9 Pro comes in three different colour options - Starry Purple, Sunrise Red, and Twilight Blue - and all of them are designed to bring unique looks to the mid-range smartphone segment. All the three feature varied colour gradients, with the Sunrise Red and Twilight Blue options featuring a petal-like pattern of diamonds, while the Starry Purple option has a speckled finish at the back. The dual camera setup at the back protrudes a little bit, but is protected by a metal ring. The fingerprint scanner is situated in the upper middle of the rear. In our short time with the device, we did see fingerprint smudges on the back of these smartphones, and some on the display as well. A big USP of the Oppo F9 and Oppo F9 Pro is support for Super VOOC flash charging, which the company claims will give users two hours of talk time with just five minutes of charging. (Update 27 September: While Oppo had said at the launch event that the F9 and F9 Pro are identical in all aspects other than the RAM, it has now come to light that the F9 also does not have VOOC rapid charging.) There's also ColorOS 5.2, based on Android 8.1 Oreo, which brings a host of new UI features. The most notable is the Smart Bar that slides out from the right edge of the display. It has shortcut icons for the camera, taking a screenshot, and your most frequently used apps. The Smart Bar helps with multi-tasking, and you can open an app in a floating window while working in another app to quickly reply to a message or check notifications, for example. The Smart Bar works with PlayerUnknown's Battlegrounds as well, and you can quick reply to WhatsApp messages whilst playing. There are also new video editing tools and AR stickers in the camera app. ColorOS 5.2 integrates the Touchpal keyboard, which supports 100 languages and includes smart features such as currency conversion, a calculator, smart replies, and more. The Oppo F9 and Oppo F9 Pro have the same dual camera setup - one 16-megapixel main camera and another 2-megapixel camera with a wide-angle lens to enable depth-of-field effects. The camera app has a Depth of Field mode, HDR mode, and Super Vivid mode as well. For selfies, the 25-megapixel front camera can use Oppo's AI Beauty 2.1 feature and live filters for creativity. We found that the cameras performed well indoors. Portraits looked good, and HDR mode seemed to do its job despite excessive lightning. However, we did notice some shake in video footage. Once again, we will reserve our final opinion until we conduct our full review. Both new phones are powered by the octa-core MediaTek Helio P60 SoC and sport 3500mAh batteries. In our little time with the devices, we noticed no lags or hiccups worth mentioning. The only difference between the Oppo F9 and Oppo F9 Pro is their RAM, with the two packing 4GB and 6GB respectively. (Update 27 September: While Oppo had said at the launch event that the F9 and F9 Pro are identical in all aspects other than the RAM, it has now come to light that the F9 has a 16-megapixel front camera instead of 25-megapixel on the F9 Pro, and the F9 also does not have VOOC rapid charging.) Internal storage for both devices is 64GB, which is low compared to what their competition currently offers. However to make up for it, Oppo offers a dedicated microSD card slot that lets you expand storage by up to 256GB. product Oppo F9 and Oppo F9 Pro have identical specifications except for the amount of RAM and their price in India has been set at Rs. 19,990 and Rs. 23,990 respectively.